Tesla Company memorandum. Memorandum from the period 1915 to 1925, showing the inventions marketed by the Tesla Company for Serb-US physicist and electrical engineer Nikola Tesla (1856-1943). During this period, Tesla occupied offices at 8 West 40th Street, New York, USA. Many of his inventions from this later period failed commercially, and he was effectively bankrupt. 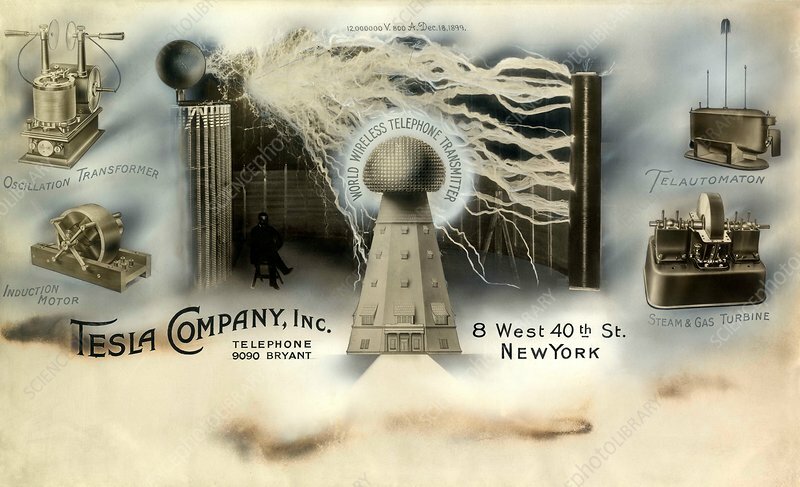 The inventions shown here are his oscillation transformer (top left), his induction motor (centre left), his telautomaton (top right), his steam and gas (bladeless) turbine (centre right), his large wireless world transmitter (Wardenclyffe Tower, centre) and his famous Tesla coil and sparks (background). Tesla had carried out research that led to key advances in areas such as alternating current power generation and transmission. The SI unit of magnetic flux density is named in his honour.